Resilient, sturdy and fast, the first-ever squirrels date back about forty million years ago and continue to evade the threat of extinction today. This tiny, twitching critter got its name from the Greek "skiouros," meaning shadow-tailed. Apart from having large incisors that never stop growing and which they continually sharpen on branches and even power lines (causing many a power outage), squirrels also possess the unique superpower of being one of very few mammals that are capable of climbing down a tree head-first, due to their strong and limber claws that lend them incomparable skill in the world of grasping woody surfaces. These little mammals are at their most active in late winter at the start of their mating games. The males chase both the females and their suitors through the trees at unfathomable speeds, all the while performing stunts that even the most fearless of stuntmen would dare not attempt. The female will usually choose the strongest male available to her, but this is a one-off; the next time she mates it will be with a different partner. Some say this is nature's way of preserving the genetic strength of the species, and may be why squirrels continue to survive and thrive. 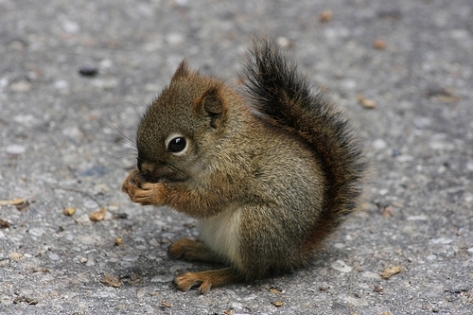 A mother squirrel usually gives birth to one or two litters of about four baby squirrels each year, all of which are born completely bald, toothless, blind, and dependent on her for guidance for many weeks. But they grow up strong and they grow up fast—these well-adapted creatures not only live to enjoy excellent vision with their large, incessantly searching eyes, but they are also sexually mature and ready to carry on a legacy that would make Darwin proud only one year into their scuttling, scrambling lives. Submitted by Sandra on Wed, 2011-01-05 00:41. That squirrel isn't related to the huge neurotic rats with fluffy tails that chase dogs (no joke. i've witnessed it) in Mount Royal park, is it?